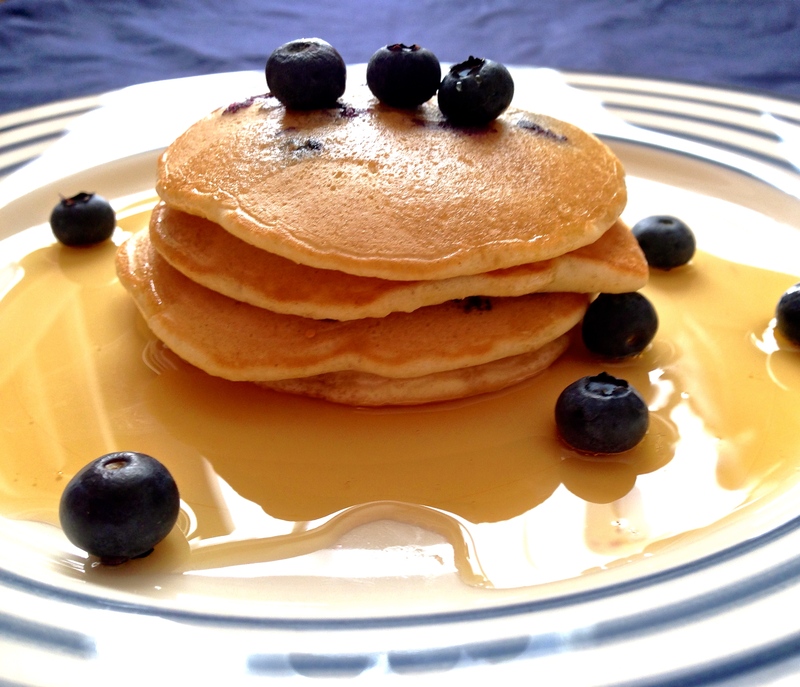 Blueberry Pancakes – Perfect for Pancake Day! 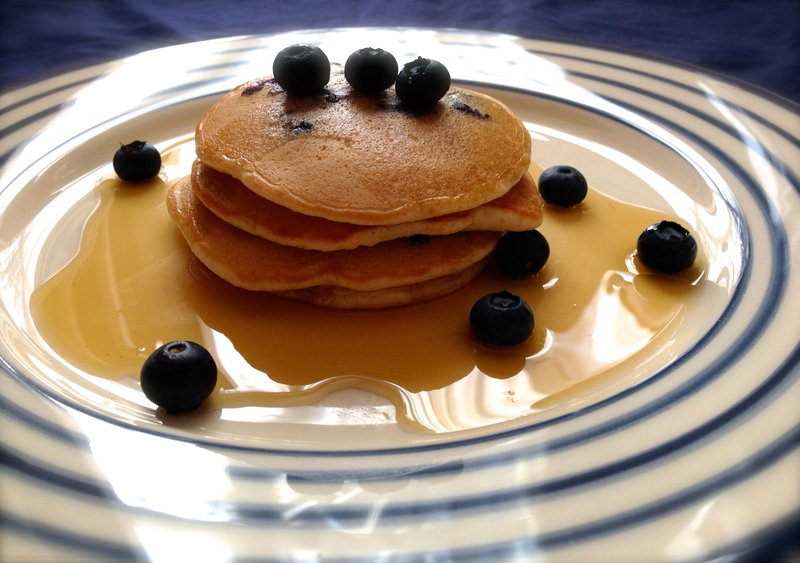 Light, fluffy American style pancakes bursting with blueberries, served with lashings of maple syrup. I love pancakes. There – I’ve said it. I love pancakes! And although I’ve done this post specifically in time for Pancake Day (Tuesday 17th Feb 2015), I really don’t believe that pancakes should be reserved for only one day of the year. These are my favourite Sunday breakfast and they also double up as a great store-cupboard dessert for when you are in need – just add a scoop of ice cream on the side. The great thing about this recipe is that you really can substitute the fruit and flavours for anything you fancy (Try replacing the blueberries with a pinch of cinnamon and 1/2 a banana thinly sliced) – although blueberries will always be my top choice. In my opinion you just can’t beat the bursts of flavour in your mouth as you bite through a sweet, juicy blueberry. To top off these pancakes, maple syrup is the only thing to use. Pancakes and maple syrup were made to go together, and the lack of over-sweetness in maple syrup makes it the perfect combination for breakfast. Always buy real maple syrup and never maple flavoured syrup (which is usually maple syrup flavour added to a pure sugar syrup) and buy the best you can afford. The better brands tend to be far less sweet and have a much deeper flavour. I really like Buckwud maple syrup which you can buy in most major supermarkets (and is currently save 1/3rd in Waitrose which is a great deal!). I called these ‘American style’ pancakes as traditional American pancakes are made with plain (all-purpose) flour and bicarbonate of soda to give them the rise. 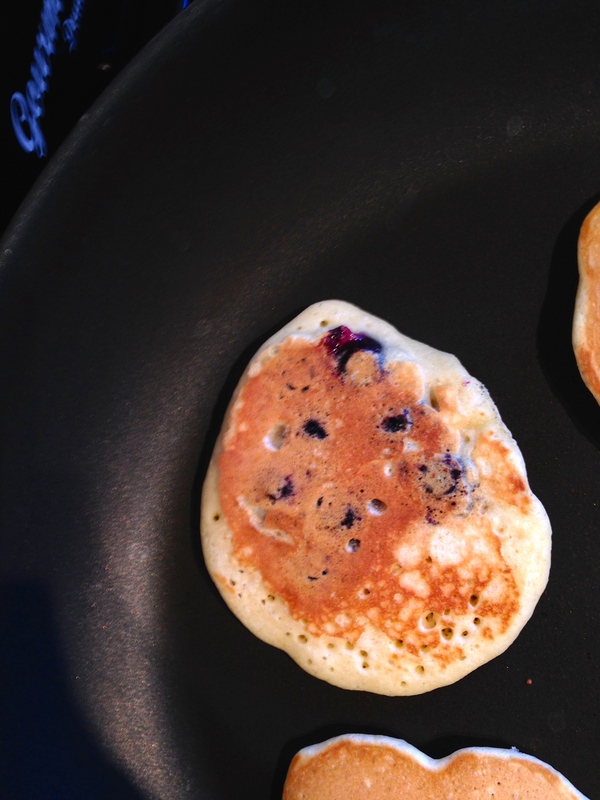 These pancakes cheat slightly as they use self-raising flour which is a pre-made mix of plain flour and baking powder, but I personally don’t find it alters the taste or texture of the pancakes and makes them even simpler to make. I hope you all have a fantastically pancake filled Pancake Day 2015! Serves two generously, approximately 16 pancakes. Takes 20 minutes. Add the flour and sugar to a bowl, break in the egg and add half the milk. 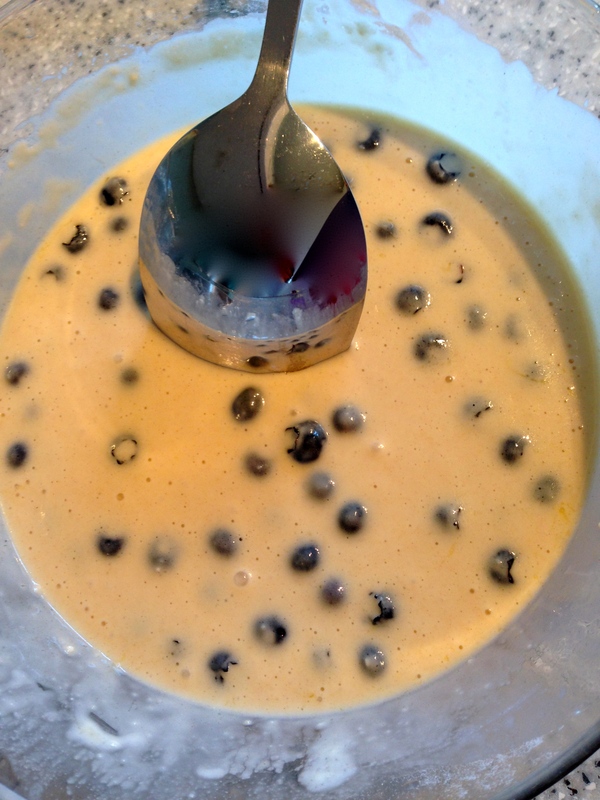 Whisk to a smooth batter, then add the remaining milk and mix again until smooth. 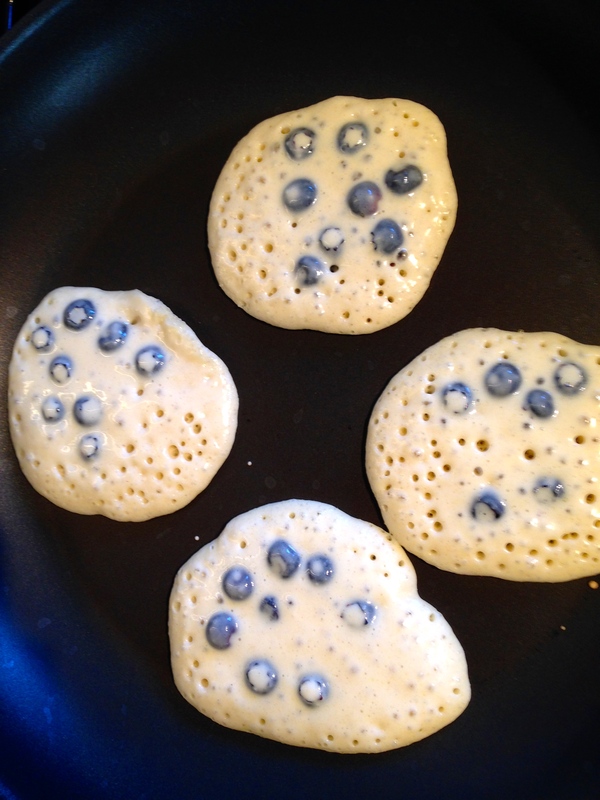 Mix in the melted butter, then fold in the blueberries. Heat a good non stick frying pan over a medium heat. 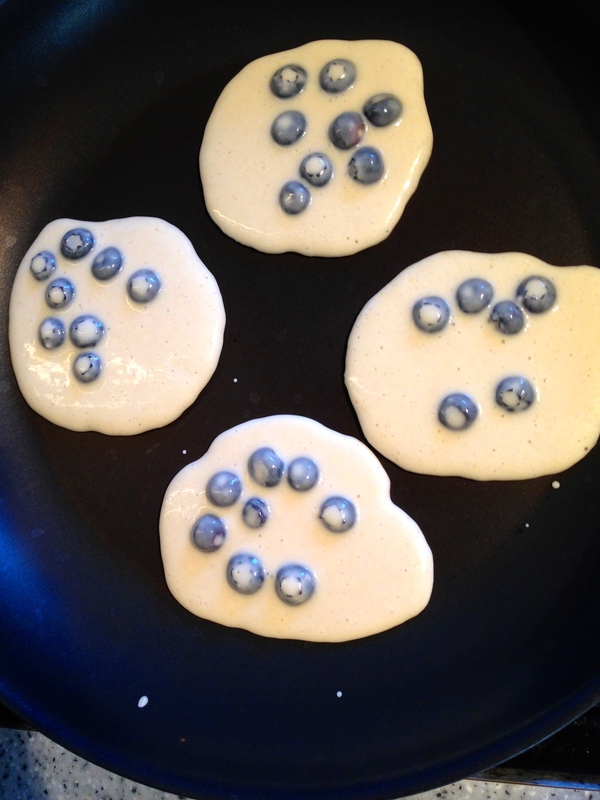 When the pan is hot, add 4 large tablespoons of batter to the pan to make 4 small pancakes. Fry for about 1 minute until the top of the pancake is full of bubbles. Turn the pancakes over (the tops should now be golden brown) and cook for another minute, until the underside is also brown. Serve the pancakes, or, if not serving immediately, place in an oven proof dish and cover with foil, keeping them warm in a very low oven. 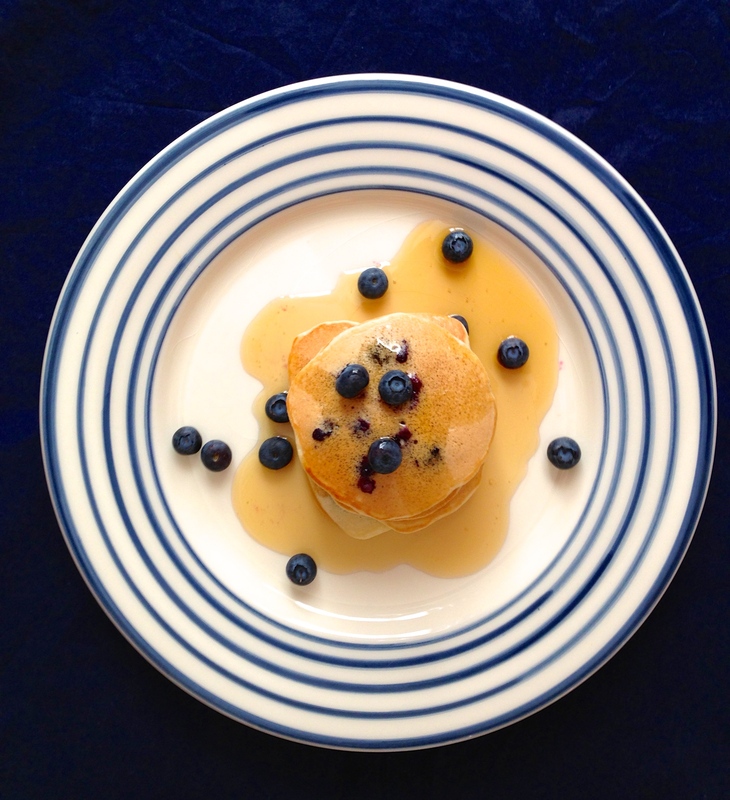 Serve with some extra blueberries and lashings of maple syrup.